The Toshiba Canvio Premium is a modern external hard drive, with a sleek aluminium enclosure, USB 3.1 / USB Type-C support and a full complement of bundled software. Read on for our full review. The Canvio Premium lives up to its name, with a well-built enclosure, multiple connectivity options and some useful added software at a premium price. There are cheaper 1TB external hard drives on the market, but if want something more then the Canvio Premium certainly delivers. The Canvio Premium sets itself apart from the crowd with its shiny aluminium design, which looks good and also should provide a good measure of protection against knocks and bumps. There’s a wee light in the corner, and a bevelled edge top and bottom. The bundle provided includes the drive itself and the cables needed to connect it: a USB 3.0 Micro-B cable and a Type-C adapter which will work well on Chromebooks and the new MacBook. There’s also a soft pouch to keep the drive safe from damage while travelling, and a spread of literature including a quick start guide (physical) and a user manual (stored on the drive itself). NTI Backup Now EZ (PC, Mac): Automatic backups to the Canvio Premium or cloud providers. Sensibly arranged, easy to use. 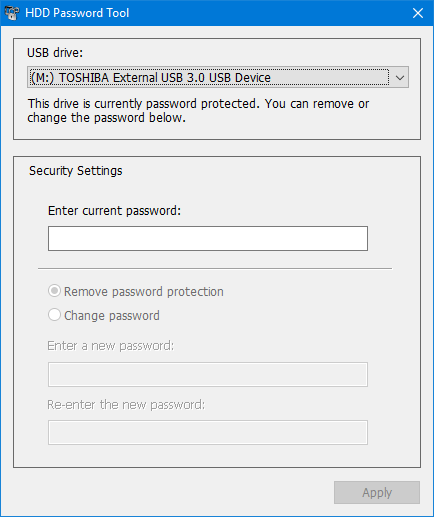 Toshiba Password Lock (PC, Mac): Locks the drive, disallowing access until a password is entered. A hint can be set, and the drive erased if the password is forgotten. Dead simple but seems to work well. Note: the HDD password tool seems to have disappeared from all but Toshiba’s German site. For that reason, you can download the tool from XSReviews here if you need to unlock the drive and don’t have it on hand. Pogoplug (PC, Mac): Cloud storage, 10GB included with drive purchase. I prefer the features and ubiquity of Dropbox, but always nice to have free cloud storage. Tuxera NTFS (Mac): mounts the default NTFS partition; you can also choose to reformat the drive as HFS+ to use it for Time Machine. The Samsung T3 will be going against some tough competition, including the value-focused Sandisk Z410 and enthusiast grade drives from Samsung and Corsair. That includes the Samsung 850 Evo, which we’ve now tested in both M.2 and 2.5-inch forms, and is coincidentally also the drive at the heart of the T3. We’ll be testing the Samsung T3 in our new test rig, which has a Core i5 6600K processor, 16GB of Crucial DDR4 RAM and runs Windows 10. We’re plugging into the USB 3.1 Type-A SuperSpeed port in the back. The Canvio Premium hits nearly 120 MB/s when reading and writing sequential data, which is pretty good for a mechanical USB 3.0 drive. It pales in comparison to the (admittedly much more expensive) Samsung T3 though, which uses flash memory. We’d expect these results to continue throughout. Once again, we see a sequential read and write speed a bit under 120 MB/s, which falls to 0.5 MB/s when it comes to random performance. That’s to be expected from a mechanical drive, due to the physical movements required for the drive to reach each new block of data. Access time is also much slower than flash-based storage, hitting 17.6ms and 23ms for reading and writing, respectively. Trends continue in the ATTO benchmark, with the drive reaching its maximum performance of around 115 MB/s once block sizes reached 64KB. You can see that performance degrades slowly over time here, with the maximum speed of 114 MB/s hit early on, then slowly falling to around 55 MB/s. Access time also slowly increases. The Toshiba Canvio Premium won’t be winning any speed tests against flash-based drives, but this is still plenty fast enough for cheap mechanical storage. The solid build quality and added software of the Canvio Premium make it a solid choice, although its price point isn’t low enough to guarantee a recommendation every time. Shop around for other drives, but keep the Canvio Premium in mind if you’re willing to pay a little extra for a well-built and well-supported drive. I’m afraid I don’t have the drive or a copy of the software anywhere. Please contact Toshiba support or the retailer you purchased it from. Sorry I couldn’t be of more help! Hi William, thanks for your reply. I have managed to obtain a copy from Toshiba Germany website of all places. Drive is unlocked and works perfectly. Great work! Could you share the link here so that other people in the same situation could benefit? I am having issues posting it, can you post it for me please ?